If cancelled or modified up to 5 days before the date of arrival, no fee will be charged. If cancelled or modified later or in the case of no-show, 100% of the first night will be charged. The amount of the first night may be charged anytime after booking. If cancelled or modified up to 14 days before the date of arrival, no fee will be charged. If cancelled later or in the case of no-show, 50 % of the total price of the reservation will be charged. 50% of the total amount may be charged anytime after booking. If cancelled later or in the case of no-show, 50% of the total price of the reservation will be charged. Children & extra beds: Children cannot be accommodated at the hotel.Any additional adults will be charged EUR 25 per night for extra beds.The maximum number of extra beds in a room is 2.Any type of extra bed is upon request and needs to be confirmed by management.Additional fees are not calculated automatically in the total cost and will have to be paid for separately during your stay. At the end of the booking process you may be offered some add-ons. Visit http://surfridersfuerteventura.com/add-ons/ to see all the details. Surf Riders Fuerteventura is the best Surf Camp in Fuerteventura (Canary Islands). We are located in Corralejo, in the north part of the island. This is the best area for surfing. The hostel has a great location; close to beaches, supermarkets, and the town centre. Surf Riders Hostel gives you the opportunity to have a fantastic Surfing Holiday in the Canary Islands (Spain). We work with the best surf school and kite surf school in Fuerteventura, and offer special packages throughout the year. Learn to surf with us! Surf Riders is equipped with several areas to relax and enjoy after a long day of surfing. 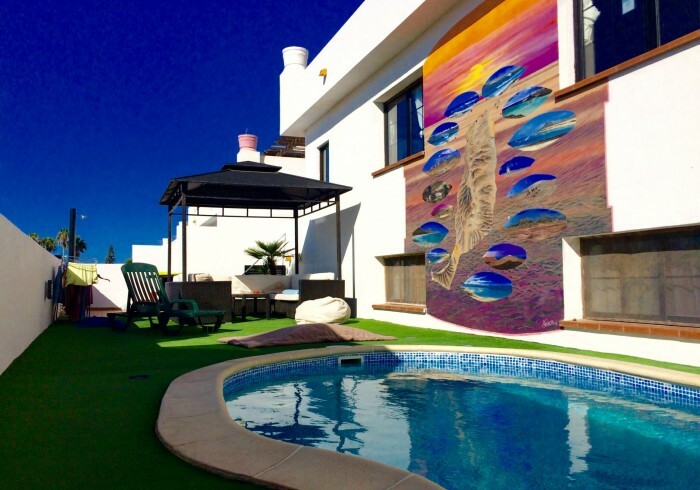 We offer a pool all year, barbecues, various terraces, overlooking the wonderful Isla de Lobos, lounge with internet, videos, music, and a fully equipped kitchen. Our hostel has a great international atmosphere and friendly staff. We organize barbecues and dinners each week. Breakfast is included for all types of reservation. Our concern is to make you feel at home and spend unforgettable holidays!! Check out all our services at a glance for a quick summary of what you can expect.